A few months ago we reported that NASA had successfully completed a Center of Curvature (COV) of the James Webb Space Telescope prior to rigorous mechanical testing to simulate launch conditions. The COV test, which measures the shape of Webb’s main mirror, was completed using a 4D Technology PhaseCam 4020 High Power High Speed interferometer. The telescope has now undergone rigorous environmental tests simulating the stresses of its rocket launch. The team at NASA’s Goddard Space Flight Center analyzed the results from the critical COV test and compared them to the pre-test measurements. The team concluded that the mirrors passed the test with the optical system unscathed. During the test, the high-speed PhaseCam acquired roughly 5000 frames per second, enabling the system to overcome the vibrations of the clean room to achieve accurate measurement of changes to the mirror’s shape. Having completed its testing at Goddard, the telescope has now arrived at NASA’s Johnson Space Center in Houston for more testing. Congratulations to everyone on the JWST project, and the 4D team that helped make this milestone measurement possible. 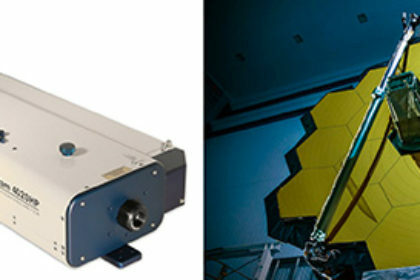 The PhaseCam 4020HP Laser Interferometer and the JWST telescope are shown below. Read more about the COV testing for JWST.